The Sudanese government is in the middle of constructing a series of dams in northern and eastern Sudan to create hydroelectric energy. However, these projects will continue to immediately flood all nearby archaeological sites, threaten to turn the flowing Nile River into a string of stagnant lakes, and begin construction without announcement because of the major protests from local affected communities, particularly Nubians who are disputing the benefits of the proposed Dal Dam (2nd cataract) and Kajbar Dam (3rd cataract). The Sudanese government has indicated that the dams will create additional electricity for the benefit of the local citizens, and electricity is indeed an uncontested factor for a country to develop, but the means to acquire this electricity is often contested and controversial. The local Nubians in the affected areas do not agree that these hydroelectric projects will benefit them, and this is based on their past experiences with the construction of the Aswan High Dam (1970), which flooded an important Nubian region in southern Egypt and northern Sudan. The Aswan High Dam created a 340-mile long lake which flooded 39 Nubian villages displacing around 120,000 people, and submerged innumerable priceless artifacts. The Merowe Dam (2008) in northern Sudan flooded more than 2,500 ancient Kushite archaeological sites and displaced 50-70 thousand Amri and Manasir, and many of these families and farmers have never been compensated for their loss of land and livelihood. Yet, the new Upper Atbara-Setit Dam Complex in eastern Sudan is schedule to open in 2016, and has displaced tens of thousands of people, many of whom have not received any of the promised compensation by the government. 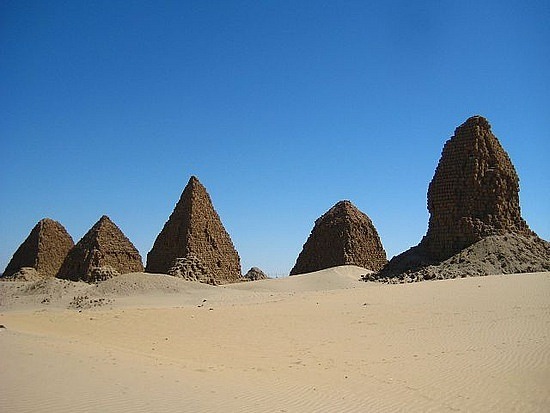 Thus, the Nubians are convinced that the current hydroelectric projects are simply part of an ongoing scheme to erase their culture, and they have organized major demonstrations against them, particularly at the Kajbar site. The Nubian environmental scientist Dr. Arif Gamal, notes that "By flooding the last of the remaining Nubian lands...the Nubians are reduced to a group of people with no sense of memory, no past and no future to look for." The effected communities including the Nubian voices should be respected in this matter, and the World Commission on Dams has clearly indicated in its November 2000 report that no dam should be built without "the demonstrable acceptance" of the affected people. 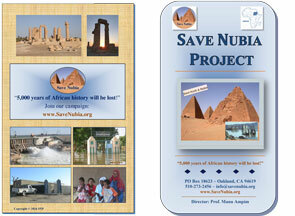 The mission of the Save Nubia Project (SNP) is to help raise national and international awareness about the pending flooding of the central areas of the ancient Kushite and Nubian civilizations in the Sudan. There are a series of dams (from the 2nd through 5th cataracts) along the Nile completed or scheduled for construction, each of which will create a large reservoir and flood countless ancient archaeological sites and displace hundreds of thousands of people. Thus, the Save Nubia Project’s task is to document that the dam construction areas in northern and eastern Sudan are valuable World Heritage Areas that are in danger of being destroyed, and should be preserved. Assist the local Nubian people near the 2nd and 3rd cataracts to build a series of museums to help preserve their heritage.